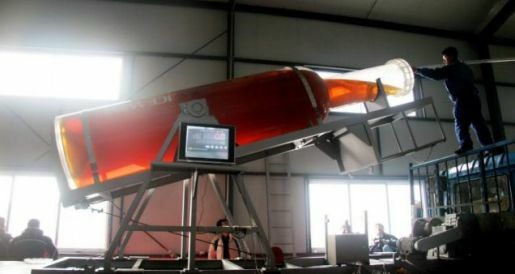 Well it looks like the Chinese vintners of Wang Chen Wines did it – they beat the world record as the biggest bottle of wine ever created… and they beat it three times over, the bottle holding a whopping 1,850 liters of wine. 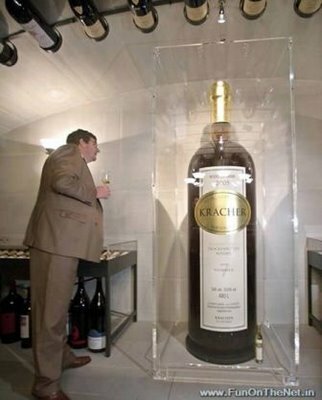 Prior to this bottling, the largest bottle of wine in the world belonged to Austrian winemakers Kracher, whose bottle held 490 litres of Grande Cuvee TBA NV No.7 2005. While I can not attest to the quality of Wang Chen Wines, I can tell you that Kracher’s dessert wines are some of the best I’ve ever tasted. According to sources, the Wang Chen Wines team each sampled a glass from the gigantic bottle attesting to the quality of the wine. They plan to rebottle it for collector distribution in the future. When that day comes, we will be sure to do a taste test! ← Laurenz V – Gold Medal Gruners!